Because the outlet of rice field cultivated in the country was trouble, it decided to make it newly. It produced it by thinking the more device if it made it anyway though it was thought that made it by the method being done by neighbors. A useless water leak was not found at all, and the water level was able to be adjusted easily. It would be greatly appreciated when serving as a reference. It is the one that it wants you to teach if there is a better method. The schematic diagram on the left, the center ridge of the paddy rice field is rib. Drainage into the right channel. 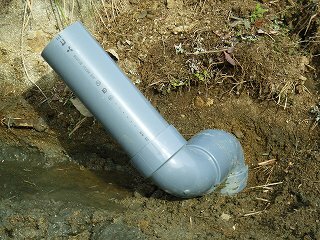 Pipes is laid with the drain pipe, and the pipe is started up in rice field. Two elbows are previously installed ..that.., and the pipe of 30-40cm is installed first ..that... The pipe has been only inserted without bonding the elbow part. It moves up and down the pipe ahead as shown in figure, and the water level is adjusted. 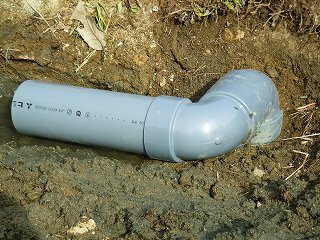 This It is a photograph of the drainage of the overflow type made by using the pipe and the elbow of VU100. It uses it at the position like this usually. I think that the pipe that ties to the elbow the elbow shifts position easily when it is made a rather short a little by little power. I made it with the pipe of the length of 8.5cm. The water leak from the joint of the pipe is not found at all. The photograph in this case when the water level is the lowest. I adjusted the length of the pipe in this point to 35cm. This length seems to have to be used and to be adjusted. It made it to VU100 this time because there was a thing that the fallen leaf and garbage, etc. are blocked though there was a thing similarly made by using VU75 before. If it is this size, it seems not to be blocked even if garbage is caught. It is very good feeling.